Custom printing is a significant factor of your canopy tent. 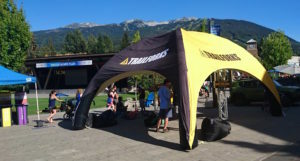 The quality of the print on your canopy represents your brand at events and most of the time is your potential client’s first impression of you and your brand. This article will go over some tips to make sure your print comes out 100%. Vector art is made using illustration software, like Adobe Illustrator. These programs create artwork formed through points, lines, and shapes, not pixels. This artwork can be scaled infinitely without losing any quality of the image. So if your logo is in vector format, it can be 2 inches wide or 20 feet wide and still be the same quality. These images are usually in .ai, .eps, .pdf or .svg format. Raster images, on the other hand, are made of pixels and can lose quality or become pixelated for print at a larger scale. While raster images can be okay to use in small-scale print, it is best to use vector graphics for all larger scale print. If you do not have your logo or graphics in vector format for print, our designers can re-create it in-house for a small fee. Want to create an awesome look for your brand and set up? Image files can be used for custom printing an image on a back wall or generate imagery or texture covering your entire canopy. The biggest issue with using image files in your print is finding images large enough to print in good quality at a large scale. Our qualifications for printing an image is the file must be at least 75-150 ppi at 25% of the scale it is being printed. But the bigger, the better! Usually a file large enough to be printed 10+ feet wide it will need to be transferred using Dropbox or a similar program and not be able to fit in an email. For all custom printing, you will be provided a proof before finalizing your order for signed approval. Before signing authorization on your proof and completing your order, you will want to look over the proof carefully. Make sure everything is spelled right, images placed correctly, and everything meets your brand guidelines. Put Our Designers to Work! We love the opportunity to get our creative juices flowing. Our designers are available to provide tips and layouts that fit the shape and sizing of your canopy to promote your business. With a quick call or email, you can be put in touch with one of our designers to go over what you were thinking for your canopy and branding. We will then provide you with a digital proof within 24 hours. If you have any questions or would like more info on our custom printing to visit our CONTACT page to reach one of our representatives.